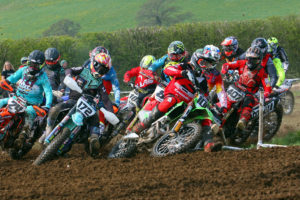 Last weekend saw Wilden MXC head back to Wales for their annual Barmouth Beach Race. In the shadow of mount Cadair Idris a fast, yet technical 1-mile track had been created to challenge all abilities. One of the largest turnouts the beach race has ever seen saw a massive turn out of quads that forced organizers to split the field, setting the scene for two epic races. Some of the best racing seen in previous years was in the Saturday club with it normally proving to be one of the busiest groups. This year was no different with a massive 60 riders entering the class. The A group was top of the programme with another field full of quality riders including Luke Merideth, Gavin Stevenson and Jamie Wainwright who was in top form after a 5th last weekend at Weston Beach Race. The Junior 85/65cc group hit the track first on Saturday morning making the most of the freshly prepared track. From the outset one rider stood out from the crowd. Sam Davies was fast out the gate in every race pulling a lead and gapping the field in style. Five commanding race wins and a massive 225 points sealed the overall after an impressive display of skill. Wilden regular Arai Elcock found it tough going as the track developed over the weekend with the ruts and berms getting deeper with every lap. A solid three second place finishes on Saturday made things a little easier come Sunday morning but a further two thirds wrapped up second overall just 2 points clear of third. Taking the final podium spot in third overall was Harvey Matthews, good pace throughout the weekend put him in with a shot of second but small mistakes during Saturdays races hampered his overall. The stand out rider in the junior 65cc class was Alfie Davies, only a year ago little Alfie was struggling around trying to finish a lap at Barmouth. Not this year, he won all 5 races in the 65cc group riding like a champ. Adding to the 65cc field this year was a star in the making. 7-year-old superstar Elvis Totney may not be able to touch the floor but that didn’t stop him completing all 5 races and finishing 2nd and an amazing 7th overall fending off several 85cc riders. Throughout the weekend one of the stand out classes for close clean racing was the MX2 open. A mix of 2-stroke and 4-stroke machinery added to the excitement as they fired down the seafront on the opening laps. Returning 85cc champ James Hanscomb was back for another shot but this year on a 125cc machine. It wouldn’t only be the new bike challenging him though as Declan Hunter was back and looking as fast ever in the sand. Saturday saw the pair share the wins with Hunter striking first in the opening race and following it up with another in the third. Hanscomb made the most of Hunters small mistakes in the second race pipping him to the post. Sunday morning saw Hunter storming out the gate taking both races wins and stamping his authority all over the class ending on 220 points and 1st overall. Hanscomb managed to hang on for second overall after struggling out the gate in both of Sundays races. The final step of the box was hotly contested with Pip Davies, Henry Yardley and Sam Beresford battling it out most of the weekend. However, it was Davies who bagged third overall after a mixed bag of results, 3-2-6-2-2 was just enough to take the final step ahead of fellow TM rider Beresford. second overall. Rob Reece and Aaron Nicholls ended the day level on points with Reece getting the spot on count back. A further point back was Andrew Ellis whose pace deserved more but a challenging second race knocked him back on the overall standings. Sam Price and Jack Vincent looked likely to challenge the top 3 with both riders firing out the gate leading in the early stages in every race but pressure from the chasing field drew out mistakes that saw them drop down the standings. The Adult open field was massively competitive with a mix of enduro and short track riders. Two riders stood out over the weekend, Brad Thornhill and Ben Coleman were the class of the pack splitting the wins between them. Saturday saw Coleman take a pair of wins with Thornhill stealing the second race. Sunday for Thornhill was looking good as he powered away at the front from the outset until a massive off saw him loose not only the lead but his seat and rear fender, damage that would see him score a DNF. It wasn’t over for Thornhill though bouncing back in the final race of the weekend with a win. Sixth overall was the best he could salvage after the disastrous start on Sunday. With Thornhill crashing out Coleman stepped up taking the overall with a 1-2-1-1-2 result over the weekend. Second overall and top 2-stroke was Matthew Hockwell whose consistent pace throughout the weekend secured a well earnt podium spot. Falling shy of second by just 5 points was Josh Canton, a strong Saturday set Canton up nicely but fading pace in the final race on Sunday saw him dangerously close to dropping off the podium. Jake Bowden was unlucky to miss out on third overall just 4 points adrift in fourth. Attracting another fantastic expert line up the adult A group was sure to be the best racing of the weekend. There was nothing between Jamie Wainwright and Gavin Stevenson all weekend with both riders dominating the class. Wainwright was in the form of his life after an epic year in the AMCA Championship and a 5th at Weston Beach Race. Stevenson was always fast in the sand and following a good year in the Maxxis he was keen to take the beach race crown. Saturday saw Wainwright charge out the gate in every moto taking three massive hole shots. The opening race went the way of Wainwright with Stevenson having to battle through the quality field. Second time round and it was Wainwright again topping the timesheets with Stevenson looking faster with every race. The final race on Saturday would prove be the best of the weekend with Wainwright having to work hard to catch Stevenson following a mistake early in the race. With one lap to go it looked a done deal for Stevenson but with just a few corners to go Wainwright was suddenly right with him. Crossing the line with just a wheel between them both riders collided ending what was an epic duel. Sunday was a more straight forward affair for Stevenson as he came out fighting taking both race wins and the overall with Wainwright hot on his tail once again. Luke Meredith was the best of the rest in third overall just 1 point clear of Barmouth first timer Corey Hockey, who recovered well after a massive race 3 crash on the first corner. Adam Wells was showing good pace but struggling on Sunday he dropped down the leader board into 7th overall. Adding to the already strong line up for Sunday was Ray Rowson. A big off in opening race saw him stone dead last with a lot of work to do but a strong final race of the weekend saw him get onto the box in third. The Quads had come from all over the country to race at Barmouth this year with some travelling from as far as Ireland. The large fields made for exciting racing in both A & B groups with talented riders throughout both. The B group saw a dominant performance from Jonny Owen on the Saturday as he took all 3 race wins but choosing to only race one day he would finish well of the podium in 10th. With Owen out of contention Dave Richards upped his pace on the Sunday ending his weekend with a final race win and the overall on 203 points. Harry Grant struggled in the challenging conditions on the Sunday but a strong set of results on the opening day saw him hang onto second overall just 2 points clear of third. Taking third overall was Wilden regular Sophie Bosworth, strong starts in every race saw her at the sharp end of the field but a massive flip and roll off in the final race hurt her overall. The A group quads was full of drama from the outset with defending champ Oli Sansom finding himself at the back of the pack after the first turn incident. A determined ride saw him climb through the order only to receive a points penalty for a yellow flag infringement. With Sansom struggling Liam Garbett stepped up the pace taking the opening race of the weekend ahead of Alex Bethell and Emma Mcquaid. Second time round it was a different story with Sansom firing into turn one with vengeance in his eyes. Three race wins later it looked as though he had done the impossible bouncing back after a disastrous start. The final race thrilled everyone as Sansom had to beat Bethell. The pair were together from the moment the elastic dropped until Bethell suddenly dropped off the pace. An issue with the steering on Bethell’s machine dropped him down the order giving Sansom the points gap he needed to take the overall. Harry Walker was having bike issues himself throughout the weekend after winning Weston beach race last week. Sunday was a much a better day, especially the final race where he caught and passed Sansom for the win in impressive style. It wouldn’t be enough to challenge for the overall though as that went the way of Sansom once again. Bethell managed to hang on for second overall ahead of a thrilled Luke Davies. The battle for third had been a hard-fought fight across all 5 races with Mcquaid, Davies and James Bevan all riding bumper to bumper. Garbett’s strong Saturday pace was all in vein as a final race DNS ruled him out the overall podium seeing him end down in eighth.